Welcome to the Worlds Youngest Black Belts in Martial Arts. Zarah Comes from a long line of karate women. Her Grandmother studied JuJitu as a young woman, her mother is a Karate Teacher and her Sister got her black belt at the age of 12. 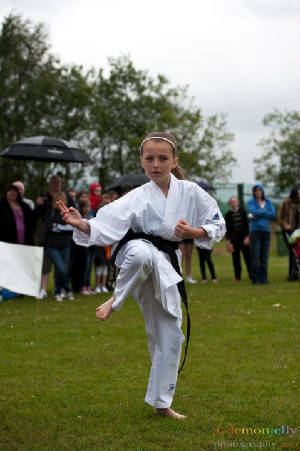 Jodie O'Neill age 8 was graded to shodan-ho in Jan 2011. her big sister Robyn has been a Black Belt with Tora Black Belt Academy for a few years and Jodie is catching up fast.. 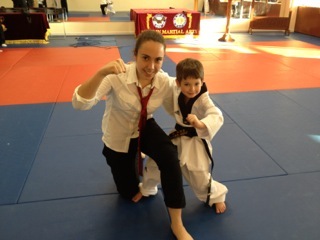 He mentor was Zarah Henderson who was Europes youngest Black Belt in 2007. Jody has been in many displays and is a dab hand with weapons. well done Jody..
Lewis Fern from Tora Black Belt Academy was graded to Shodan-Ho in July 2011 at the Tibetan Buddhist Centre Kagyu Samye Ling at the grand old age of 8 years. He trains 5 days a week andis a great roll model for all young boys. 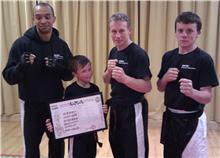 He is the youngest male black belt in Europe and has made his family and clubs very proud. trains twice a week and has been doing karate since he was 4 1/2. 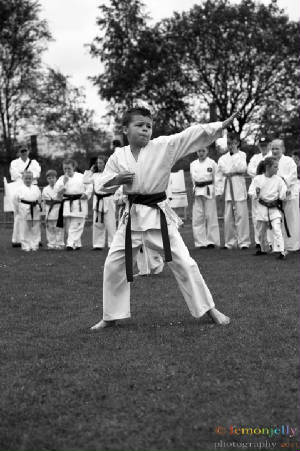 This is Zac: he's eight years old from Wales and is the youngest shotokan karate black belt in the country! The first student to become the world's youngest Black Belt in Koo Self Defence in the U.S.A. at age 5, was Joshua Bishop on June 3, 1995. Prateek Alkesh one of the world's youngest black belt holders in the Shito Ryu style of karate, a style characterised by emphasis on power in the execution of techniques. The six-year-old was recently the probationary black belt by `Dei Sensei' Moses Thilak, who is also chairman of the All India Karate Federation. 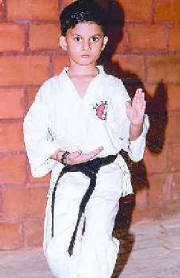 A Class 1 student of the Kendriya Vidyalaya, Pattom, Prateek started learning karate at the tender age of three. 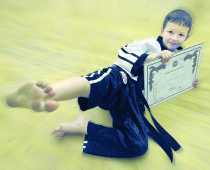 Daniel Dunn is the youngest Shukokai karate kid in Britain to gain a black belt. 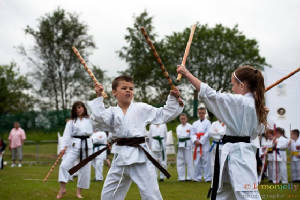 Daniel, aged eight, began training on his fifth birthday at the Tamikai karate Club in Brinnington. 7-year-old Kari Wismar of Wollaston, became the youngest black belt at the Jae H. Kim Tae Kwon Do Institute in Quincy Center. She is pictured with, from left, instuctor Stephen DeLuca, head instructor Gyo Sun, and instructors Ellis Lawrence and Lucas Lambert. Chief Instructor, Representative Japan Karate Association, Sri Lanka Branch. Head Quarters : 10/19, 1st Lane, Manthrimulla Road, Attidiya, Dehiwala, Sri Lanka. Ethan Comer, of Tennessee Academy of Martial Arts in Lafollette Tennessee is the youngest black belt ever promoted to first degree black-belt at age 6. Ethan currently holds the third degree black belt in tae-kwon-do. Alexander Maskeny, is only 7 and just received his black belt, in fact he received 3 black belts from “The World Tae Kwon Do Federation”, “Tae Kwon Do Ji Do Kwan, Korea” and “U.S. 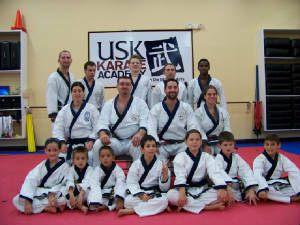 Tae Kwon Do Grand Master Society”. 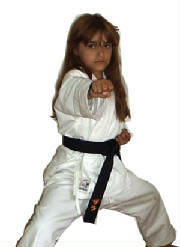 Only 7 years old and going into the third grade, Anushka Dogra, of Ada, has earned a black belt in Tae kwon do. There are multiple reasons for young children to quit, he said. “Many people go for a year, but it requires patience, concentration, and discipline to continue. Other kids look at the activity as only a hobby,” said Park. Anushka, who attends Forest Hills Collins Elementary, keeps up with her studies and is "above her grade level in academics," said her father Munish Dogra. There is an extensive time commitment for the whole family. "After work I hurry home and pick her up in the drive two to three times every week," he said. “I think it has been a very good experience for her. She really wanted to do it, persisted through and didn’t slack on her studies,” he said. The belts repeat themselves on levels know as dans or degrees. 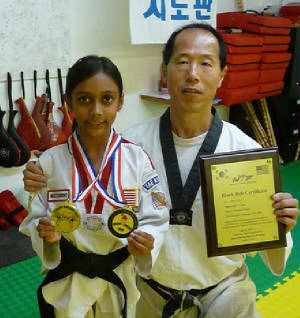 Park holds a seventh degree black belt and Anushka has completed the first dan. 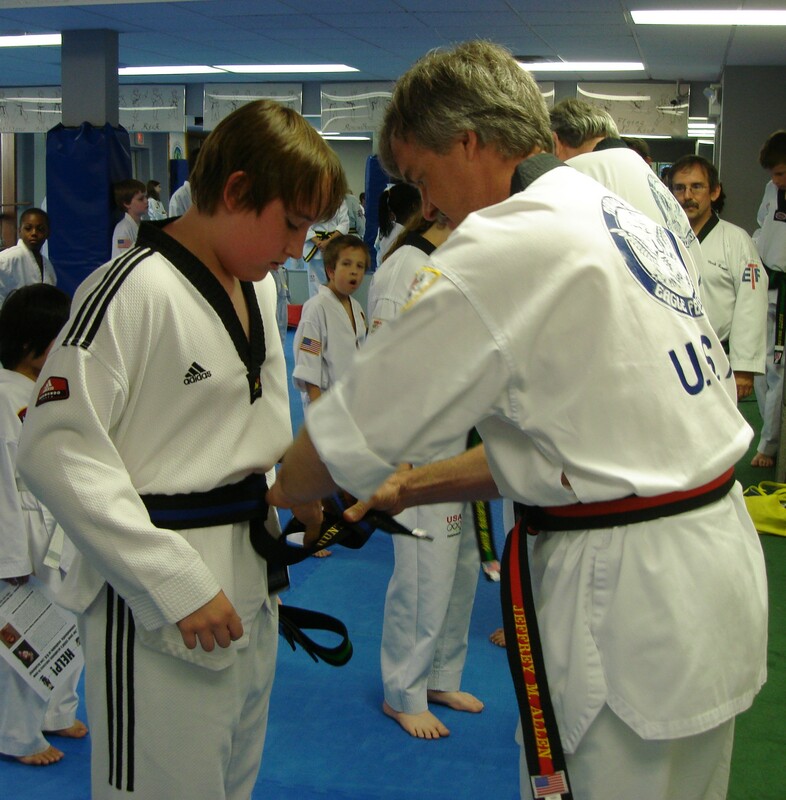 Each belt level requires a test of skills and techniques but to obtain the black belt, the applicant must demonstrate all of the skills in each of the belt levels in a comprehensive three-hour examination. Her skills have not gone unnoticed in competition either. In a recent tournament near Lansing, she brought home two gold medals. 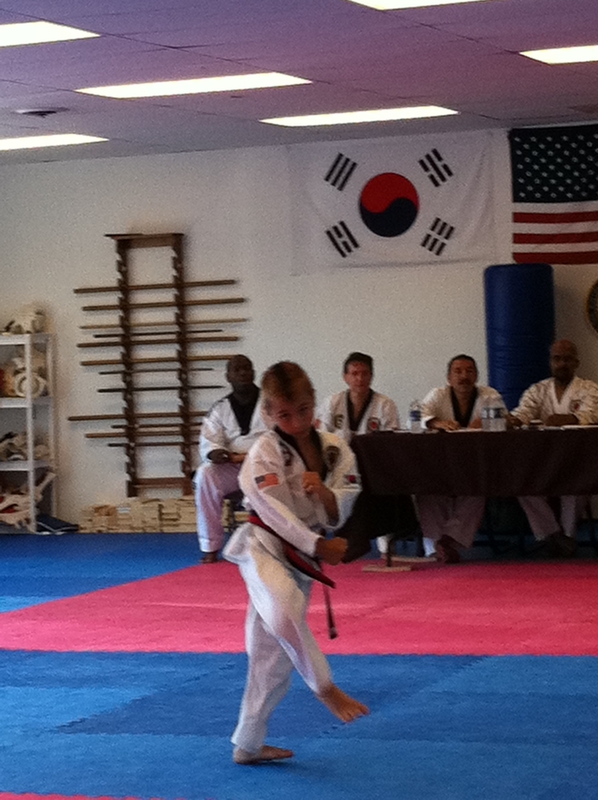 Earning a black belt at such a young age is a major accomplishment. Her mother tried “Goggle” to find out just how unusual it might be. “I think she may be the youngest in Michigan,” said Hema. Anushka is still waiting for her certificate, which will come directly from Korea from the World Tae Kwon Do Federation. 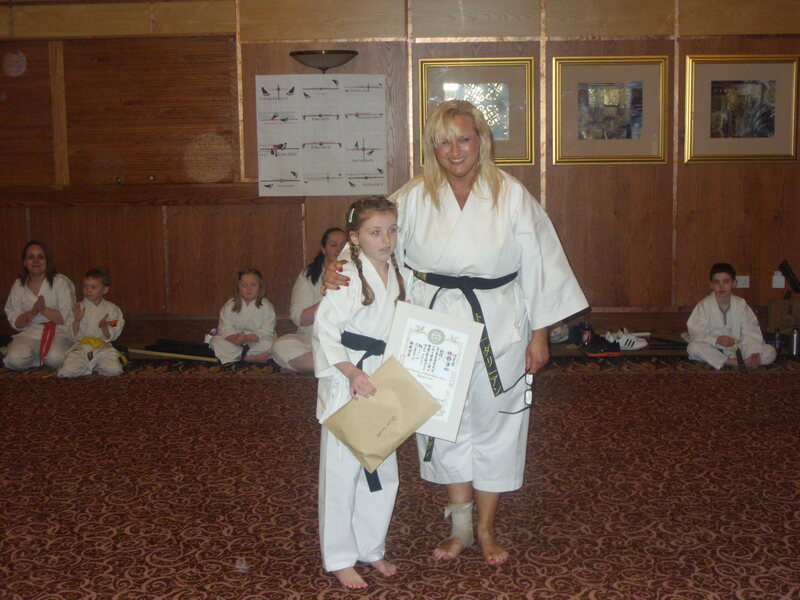 “I am very proud of myself that I achieved the black belt,” she said. She is from Grand Rapids MI , USA. 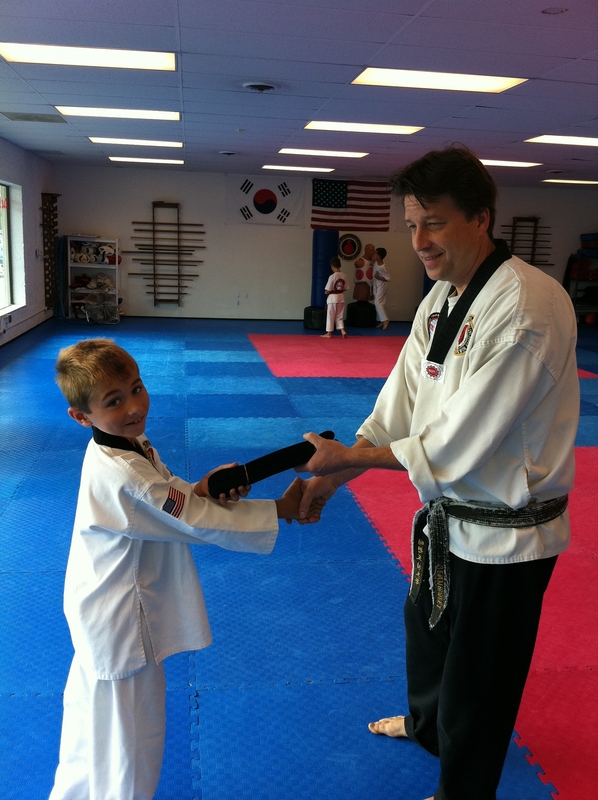 John Dykstra Earned his 1st Dan Black belt at 6 years old in taekwondo John is from Lovetttsville, Virginia. He has been taking Taekwondo since he was 3 years old. He Attends Dragon Yong In, in Loudoun County, Virginia, and Lovettsville Elementary School where he is in the 1s grade. As a colored belt at 5 John won 1st place in forms, 1st in Sparring and 2nd in Breaking in the US Open Championship. As a Bo Belt (temporary black belt) John placed 1st in Forms and Breaking at the 2011 US Open he did not compete in sparring due to a training conflict. He has competed in many other tournaments and has become very accomplished John is a twin and his twin sister will earn her first dan in TKD in June of 2012 at the age of 7. Johns Goal is to remain in TKD represent the United States in the Olympics and become a GrandMaster. John has also started his training in Hapkido and Gumdo. 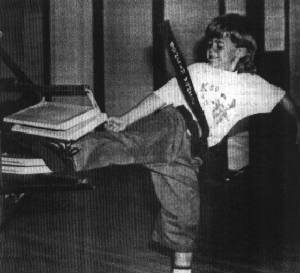 John “Hunter” Fitzgerald of Great Falls, Virginia began Tae Kwon Do at the age of five at HK Lee Tae Kwon Do Academy in Herndon, Virginia. 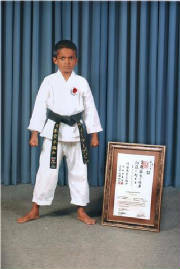 At the age of six, Hunter became a member of the HK Lee Tae Kwon Do Demo Team. Hunter never missed an exam and through his hard work and determination Hunter earned his 1st Degree Black Belt at the age of seven. When Hunter was ten, the HK Lee Demo Team earned first place in the National Demo Team Competition in Mebane, North Carolina. 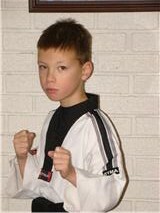 Hunter continued his training in Tae Kwon Do and, once again never missing an exam, went on to earn his 4th Degree Black Belt at the age of thirteen. Hunter is the youngest person in the academy to earn a 4th Degree Black Belt and is believed to be one of the youngest in the nation to earn such a high level. 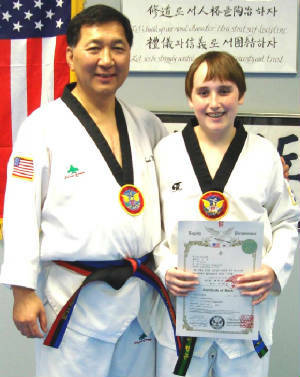 In April of 2012, Hunter will assist his father, John J. Fitzgerald, in earning his 5th Degree Black Belt. 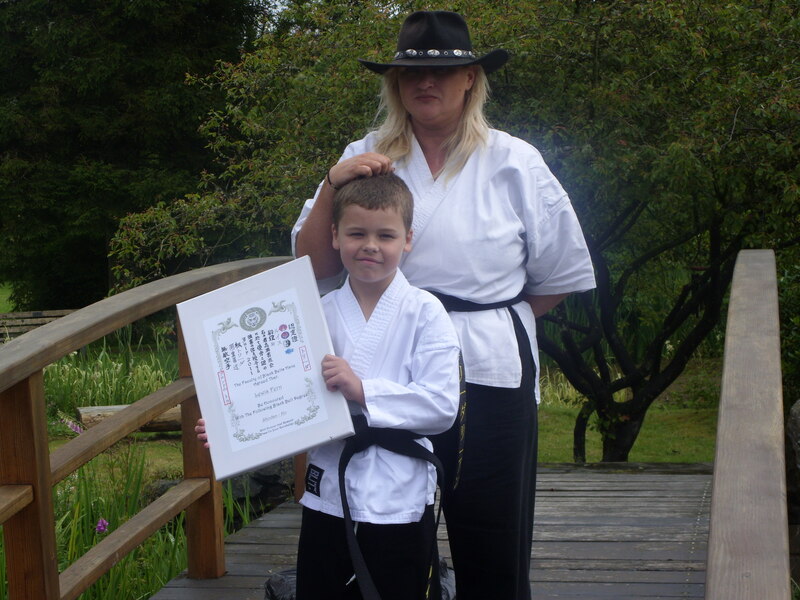 Hunter’s mother and sister are also Black Belts (2nd Degrees). 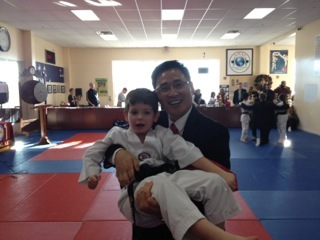 Hunter and Grandmaster HK Lee on the day he was awarded his 4th Degree Black Belt Certificate. Only 7 Years & eight months and going into the third grade, Daksh & Darsh of Mumbai have earned a black belt in Karate(Goju Ryu style). They were introduced to Karate when they completed five years. “Many start at such a young age but don’t finish as it requires patience, concentration, and discipline to continue. Other kids look at it as only a hobby” said Shihan Salauddin Ansari who is their instructor at Martial Arts Training School. “They were exposed to a lot of activities like chess, football, basketball, piano, swimming, table tennis and Karate but they continued only with karate” said their father Ketan Thakkar. There is an extensive commitment from the whole family. “Since I work in stock market and get free from work early, I used to drive kids to karate and other sport activities everyday” he said. “The boys like activities which burn their energy and that is probably the reason why they like karate”, says their mother Hetal. “They also like and do swimming a lot but were not keen to pursue it as a sport”, she said. 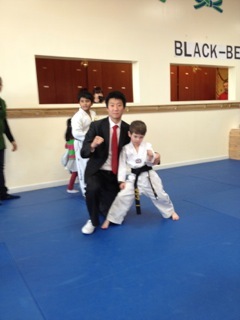 “I am very happy and proud of myself to receive the black belt”, is what the kids said. “Whenever I see them practicing karate it gives me happiness and pride to have such wonderful students and reason for me to continue teaching karate” says their sir Shihan Salauddin Ansari. “The real credit goes to their parents who made sure they were there in every class and even sat with them throughout the sessions..” says their teacher Shihan Shaheen Ansari. The black belt which -- comes after white, yellow, orange, green one, green two, blue, brown one, brown two, brown three and black – is a sign that a person is a true professional practitioner of the martial art. Their instructors Shihan Salauddin Ansari has been 5 times national champion and his wife Shihan Shaheen Ansari is a sixth degree black belt and the only woman from South Asian country to become a World Karate Federation(WKF) refree. Earning a black belt at such a young age is a major accomplishment. Their father tried to find out just how unusual it might be and checked with their instructors who said that they are the youngest in Mumbai to achieve this feat and maybe the youngest pair of Twins in India and the World. He also wrote to the Limca Book of records but the editor replied that as a policy they did not keep records of children under 12 for martial arts records.